Complexometric titration is based on the fact that certain organic compounds form stable complexes with metal ions in solution. CENTRAL TYPE: in general the central atom is a metal ion in transition which tends to form complexes after interaction between type d orbitals with s and p type orbitals on the ligands. The resulting bonds have such energy that the wave lengths of the visible lead to electronic transition. This is why the complexes, also known as coordination compounds, are coloured. LIGANDS: are those ions which have at least one lone electron pair available to form a bond. COUNTERION: the ion necessary for electroneutrality if the complex is charged. The number of complexes any cation tends to form with the electron donors (ligands) is referred to as its coordination number. Ligands can be grouped in different ways depending on the number of coordination bonds they manage to form with the transition metal. The term monodentate refers to a type of chemical that forms only one coordination bond; while bidentate, tridentate, tetradentate, penatadentate and hexadentate chemicals have more electron pairs available and so form more bonds. The complexes that polydentate ligands form are referred to as chelates. Definition with polycarboxylic acids: a polycarboxylic acid is an organic compound containing two or more carboxylic groups (-COOH). Tertiary amines which also contain carboxylic acid groups form particularly stable chelates with many metal ions. is normally used like sodium salt to increase the solubility. Hg2+, Mg2+, Mn2+, Ni2+, Sr2+. The oxygens in the four carboxylic groups deprotonate, and one of the lone electron pairs left on these is available to form a coordination bond with the metal ion. 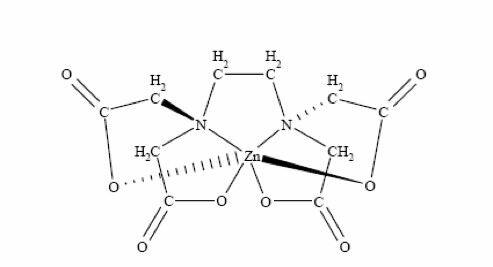 The two nitrogen atoms each have a lone electron pair too and form a coordination bond with Zn2+. The complexes formed are very strong because they form stable five-membered rings, i.e. chelates. The strength and stability of EDTA complexes depends mainly on the pH. The number of electron pairs actually available to form coordination bonds depends on the dissociation levels of the acid groups and therefore the pH. Unfortunately it is not possible to perform titrations with EDTA at a very base pH because we need to avoid the precipitation of metal ions like hydroxides. The fact that it is not possible to operate at a sufficiently base pH means that the complexation reaction is not as complete as we would expect (even though it is remains very close to the formation of the complex). As we have already pointed out, titration occurs in the presence of a suitable indicator that can change colour close to the point of equivalence. 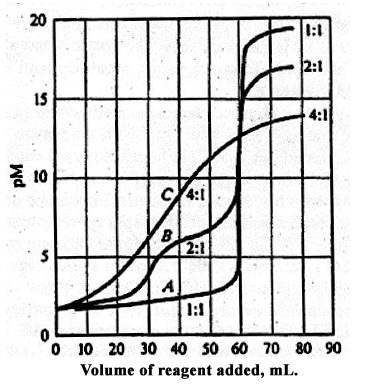 In the case of EDTA titrations, the indicators are organic colorants that form coloured chelates with metal ions. 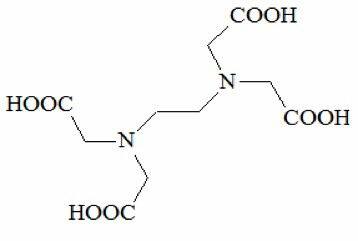 The most commonly-used indicator is eriochrome black T. This is a triprotic acid. Complexometric titration with EDTA is used for the determination of any metal ion with the exception of alakaline metals. EDTA may not appear to be selective but, in reality, it is possible to control interference quite well by regulating the pH. Interference from a particular ion can also be cancelled out by using an appropiate covering agent, a complexing agent that reacts selectively with the interferent in the solution. By doing this we stop the component from interfering during the analysis. 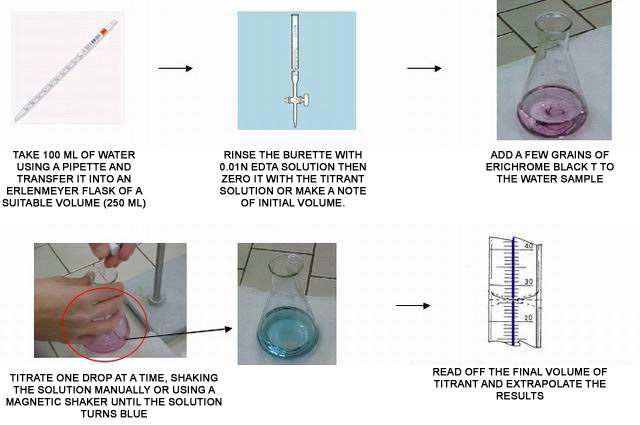 Direct titration: the cations are titrated directly with standard solution EDTA using eriochrome black T as the indicator. 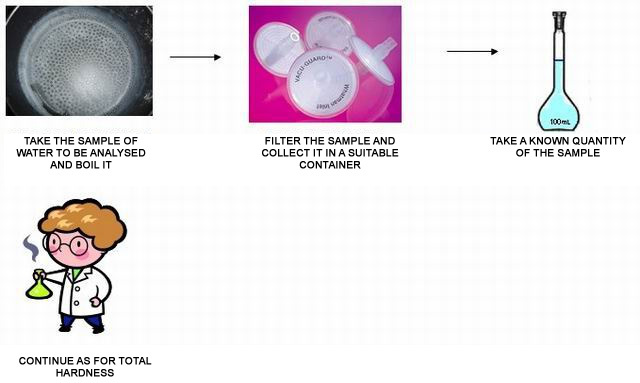 Back titration: a known excess of standard solution EDTA is added to the solution containing the analyte. When the reaction is complete, excess EDTA is back titrated to the end point using a magnesium or zinc standard solution with eriochrome black T. This procedure is useful for determining cations that form stable complexes with EDTA and for which there is no effective indicator. It is also often used for those species of ions which react very slowly with EDTA. The concentration of Ca2+ and Mg2+ cations dissolved in water is described as the hardness of water. The two cations are essential for humans and other living organisms, but it is also vital to control their concentration in drinking water and water for industrial use because of the practical consequences of their presence. In fact, calcium and magnesium form insoluble compounds with carbonated anions cumulatively termed lime. Determining the hardness of water is therefore a necessary test as a measure of water quality for domestic and industrial use. If there are too many of these ions it can lead to the formation of limescale inside electrodomestic appliances like washing machines and dishwashers making them less efficient. The formation of lime deposits in tubes or pipes is also a problem for industry where the equipment is water-cooled. Water which is too rich in calcium also makes soaps precipitate, making household detergents less foamy. In areas where the water is very hard, people need to use more detergent to get things clean. Is due to the presence of Ca2+ and Mg2+ salts like bicarbonates which, when boiled, decompose to form insoluble compounds of the two metal ions. At high temperatures, the equilibrium of the reaction is towards the right (CO2 gas is released and calcium carbonate precipitates). 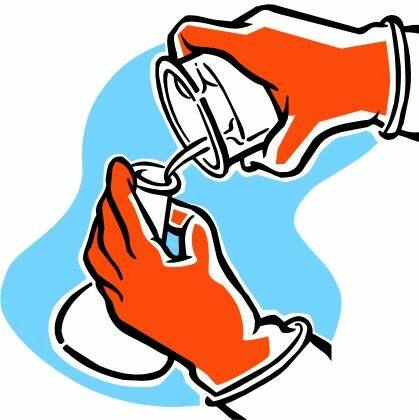 Is due to those salts that remain in the water despite prolonged boiling (chlorides, sulphates, nitrates, carbonates). The sum of the temporary and permanent hardness is called total. English degrees 1 grain CaCO3/gallon of water. They use a different unit for both weight and volume. Concentrations of calcium and magnesium in water are normally expressed in french degrees. 1 german degree = 0.56 french degree. Carried out through titration with EDTA, complexants of alkaline earth metals. Titration is performed in a pH = 10 solution (adding an ammonium buffer to encourage complexation of the Ca2+ and Mg2+ ions). Eriochrome black T is used as the indicator to demonstrate the end point, as it forms deep red-wine coloured complexes with a very small part of the Mg2+ions. At the equivlence point, once all the Ca2+ and Mg2+ ions have been complexed and released into the solution, further addition of the titrant causes a change in equilibrium reaction of the Mg - eriochrome black T complex which, once it is free, turns a cobalt blue colour. Lastly, we need to bear in mind that, given the definition of french degrees (°f = 1g of CaCO3/100 L H2O) titrating 100 ml of water with 0.01 M EDTA, the number of millimetres for the titration is the same as the degrees of hardness expressed using the french units. Suppose we have titrated a sample consisting of 100ml of water with 19.0 ml of a standard 0.0100 N EDTA solution. Determine the total hardness of water expressed in french degrees and in mg/L of CaCO3 (ppm). mg/100mL = g100/L (°F), so the hardness of water is 19.01 °F. The water is medium hard. mg/100mL = g/L, so the hardness of the water is 12.4 °f. Temporary hardness = total hardness – permanent hardness = (19.0 – 12.4) °f = 6.6 °f.